The Roots of Resistance is now available on this website and in ebook and print formats on Amazon and all major online bookstores! Rivera Sun always gifts us with usefully creative fiction in the face of daunting challenges to future generations, to current society, to marginalized communities, and to all of us as citizens of our planet. 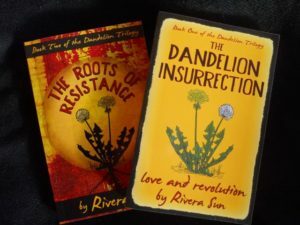 Her Roots of Resistance – the second novel of her Dandelion Trilogy – offers an inspiring story to help guide love-based strategic change efforts during what promises to be a very messy transition to a better world. The novel imagines deeply human responses to our civilizational predicament and to the challenges we (especially as change agents) will face as we try to put such responses into practice. This novel takes seriously the idea not only that we face innumerable societal problems – especially in vulnerable marginalized communities (those sizzling cauldrons of possibility) – but also that we are heading into increasing systemic dysfunction – that our traditional mainstream institutions, systems, and power centers are – at the very best – not able to competently and fairly deal with these challenges – and, at worst, are actively generating greater injustice and suffering. Some of the players in that high drama are playing their roles selfishly and intentionally. Others – civil servants, waitresses, programmers, truck drivers – are just caught up in a business-as-usual system that is designed for short-term, unjust and problematic outcomes that especially benefit a few elites. From a strategic nonviolence perspective, the former need to be shown they will not be allowed to function normally, while the latter need to be invited – sometimes through provocative demonstrations of powerful caring – into another way of being and operating that holds promise for a better world. And that can involve individual and collective activities that thoroughly gum up the workings of the Mainstream Machine – which, incidentally, makes for a fascinating weave of unfolding plot lines! It doesn’t require great literature to draw us into this narrative. It just takes a really good storyteller who knows what she is talking about and can carry us along a compelling thread of adventure that makes us want to keep at it to see what happens next – partly because it may well happen to us soon in real life. It takes a storyteller like Rivera Sun who inspires us to rise to the challenge as her characters do, because her stories tell us how. Into her narratives Rivera Sun – who is, after all, a skilled nonviolence trainer – weaves deep knowledge of the energetics, possibilities and challenges of nonviolent struggle with the complex, varied, and emotionally intense lived experience of real people caught up in the dynamic tensions of that struggle. Her characters – from dedicated activists to ambitious politicians to ordinary folks and a strange volunteer bodyguard – are lifted from real life and their tactics, strategies, and shifting perspectives and motivations have been discussed by activists and academics for decades. We see many of those conversations reflected in the book’s dialogue – notably the incredibly important and challenging issue of what constitutes violence and where – if anywhere – it fits in a strategic nonviolent movement. We also see debate over whether and how to collaborate with members of the establishment who act like they’re friends, and how fraught with opportunity and danger such collaborations can be. For many such issues there are no obvious answers. The “struggle” in nonviolent struggle is not only between the movement and its opponents, but within the movement, and within the hearts and minds of every person involved, on all sides. Rivera Sun’s continual return to love as the primary touchstone – the source of both the power and wisdom of nonviolence – offers a glimpse of where the elusive answers may lie. But only a glimpse, because it turns out that even love is an ambiguous, intuitive guide when the challenges of relationship and strategy intensify to the breaking point. We see a lot of that here. This is not a quiet, peaceful book. It is a book of questions and challenges, subterfuge and sudden transformations, disagreements and failures, insights and obliviousness, with visions and values dancing together in every corner of the story. The complexity of real life is abundantly on display, as are the heights of clarity and caring. Rivera Sun’s descriptive language is intense, lyric, sometimes mystical, magical, almost psychedelic. It made me dance between dismissing it as overdone and examining the quality of my own experience, wondering how much I subdue my own wildly surging aliveness. To look at the world through Rivera Sun’s eyes is to see things with a vivid brilliance appropriate for someone with such a solar name and spirit! I suspect the ideal role for Rivera Sun’s books – including notably this one – is to stimulate conversations about who we are in the world and why, and how we may want to take action because of that. And then to act, to live with open heart into her empowering stories of change. Tom Atlee is vice president and research director of the Co-Intelligence Institute, and the author of numerous books on social change agentry, including Empowering Public Wisdom: A Practical Vision of Citizen-Led Politics and Reflections on Evolutionary Activism: Essays, Poems and Prayers from an Emerging Field of Sacred Social Change. Thank you Tom Atlee! You are the perfect person on earth drawn into and to praise the writing of Rivera Sun for all of your activism as well.. we all seem to have our own recipes and predeliction of how our activism gets initiated and how it evolves…. I wonder sometimes about all the energy we put together in our lives to wish to change things… change is inevitable and it’s happening all around us but there are those few who wish to make things worse, who want to make war who have been brought up in an era of wealth and privilege… what a life, what an incredible physical experience…. I wonder what both of you would think of a book like Beyond Hope by Debra Ozarko…. It has been blowing my mind because it is questioning that foundation for continuing the activism type of work… there is this hope, just as in when a friend has a deadly illness one may do very thing possible to heal that friend… and then the final diagnosis is in and it’s final that death is imminent…. wow what then???? Prepare for hospice? According to her manifesto there is no turning this around… humans have given earth a huge walloping and no amount of recycling, solar panels are going to fix this…. Ive been walking around like a dazed humanoid….where did my hope go for humanity? What does it mean to be honestly and ruthlessly honest with our grasping of hope? What about a planetary hospice movement that has had the courage to go beyond hope? To go beyond the physical consciousness? Why is it that nearly 100% of people who have experienced a near death experience have been catapulted into another dimension as it were and have created something entirely new for themselves… change careers, leave mates, etc….. maybe that’s what this is all about…. how do we create a near death experience now.. what type of activism if any evolves into a new level of consciousness? Maybe Rivera sun is one such being and has been catapulted into being a voice for the voiceless… maybe it’s a precursor to the planetary hospice movement….where perhaps love and transformation simply is allowed to breathe while we grieve the known…..